The Snowdon Push is Back Up’s toughest, yet most exhilarating fundraising event and tests each and every member to the max. It’s an amazing experience that brings together people from all walks of life to work as a team and reach one of the highest points in the British Isles, all whilst raising funds for people with a spinal cord injury and their families. The Push involves teams of between 10 and 16 people aiming to conquer the highest mountain in England and Wales, Mount Snowdon, which is over 3,500 ft high. 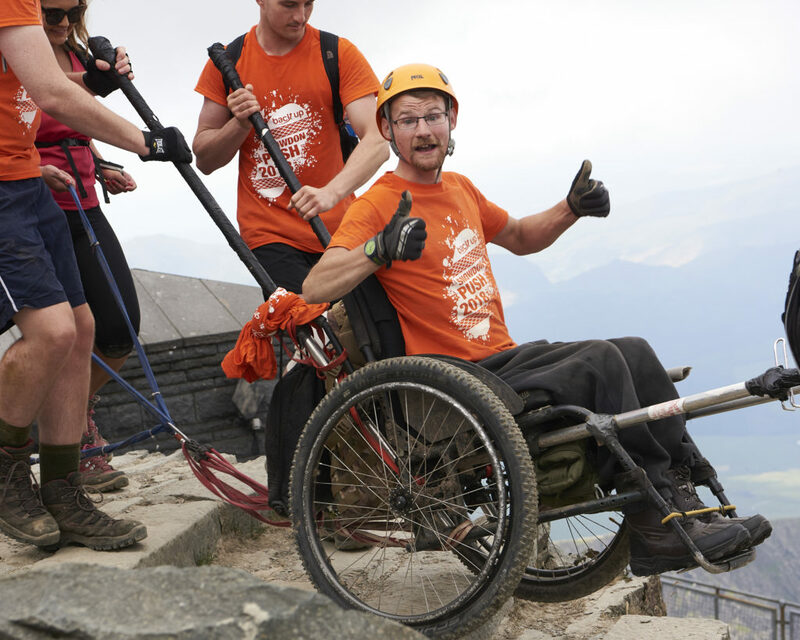 One member of each team must be a wheelchair user, which means pushing, pulling, climbing and wheeling as a team to reach the summit and back down again, covering approximately eight miles of steep, mixed surfaced terrain. If you’d like to take part in the 2019 Snowdon Push, register as an individual or as a team below. Even if you don’t have your own team, please do sign up as we can help match you with other participants. For more information, please email Alex or give her a call on 020 8875 1805.